To say patient safety is a priority for behavioral healthcare facilities is an understatement. Federal, state, and local laws and regulations offer an array of requirements for facilities to meet, but behavioral healthcare organizations also bring their own patient safety standards to the table. New inpatients are often at their most vulnerable, and self-harm protections must be considered. However, experts say design doesn’t have to be hampered by the need for safety. The fact is, facility design has a tremendous impact on patient safety. It impacts how people move through the building, how much of a given area staff can see at one time and how people feel when they are in specific spaces. 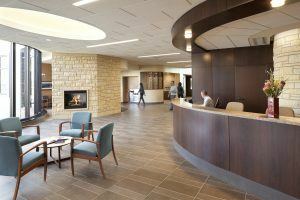 To create spaces that meet patient and staff needs, Sanders suggested that behavioral healthcare leaders set parameters for design. That means evaluating the floor plan to identify the most critical and noncritical areas of the facility, including public areas, and identify materials acceptable for each one with more specific guidelines for bathroom design. Experts agree, there is no one size fits all. For more information, read “Consider Protections for Specific Patient Populations in Designs” in Behavioral Healthcare Executive.